Former Real Madrid coach John Toshack says Rafael Benitez's departure from the Spanish giants will not adversely affect Wales forward Gareth Bale. Benitez has been sacked after just seven months in charge, with club legend Zinedine Zidane replacing him. Bale, 26, is reportedly upset by Benitez's exit but Toshack thinks his compatriot will stay at the Bernabeu. 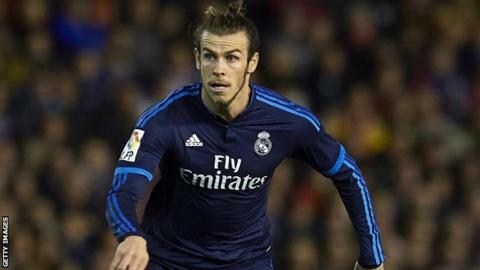 "I don't see it affecting Gareth at all," Toshack said. "I don't see that as a problem." Bale joined Madrid in a world record £85m move from Tottenham in 2013 and has scored seven goals in his past six games for Real - but he has been linked with a return to the Premier League with Manchester United. Former Liverpool and Chelsea boss Benitez's final game was Sunday's 2-2 draw with Valencia, which left them third in La Liga, four points behind leaders Atletico Madrid and two adrift of Barcelona. Frenchman Zidane is the 11th coach to be appointed in Florentino Perez's 12 years as club president and his first match in charge will be Saturday's home league game against Deportivo la Coruna. Ex-Wales manager Toshack, who had two spells in charge at the Bernabeu, is not surprised by Benitez's departure. "Benitez was up against it right from the off," Toshack told BBC Radio Wales Sport. "Right from the minute he walked through the door something was not quite right. I don't think his face fitted. "I think he'll be looking to take a bit of a rest season, probably until the end of this season and maybe look at something next pre-season." Was Benitez doomed from the start? Read more on Real Madrid sack Rafael Benitez: Was he doomed from the start?